Car Accident Checklist from Smith Insurance in Rochester NY. Whether or not you have been in a car accident, you can probably imagine how hectic things can become. In the hustle and bustle of making sure that everyone is safe and uninjured, that the police have been contacted, and ensuring that you and your vehicles are out of harms way, it can be easy to forget to gather a few key pieces of information. Smith Insurance has developed a simple checklist to use as a guide in the unfortunate event that you are involved in an accident. We recommend attaching this form to your auto insurance id card and keeping it in the glove compartment of each of your vehicles. First – be prepared! Keep these instructions, along with your car insurance ID cards, Vehicle Registration, and emergency contacts in your vehicle. Second – be safe! Move your car to a save location. Check to see if anyone is hurt, and call 911. Contact the police. Third – exchange information! Collect info for anyone who was there, including other drivers, witnesses, and the towing company. 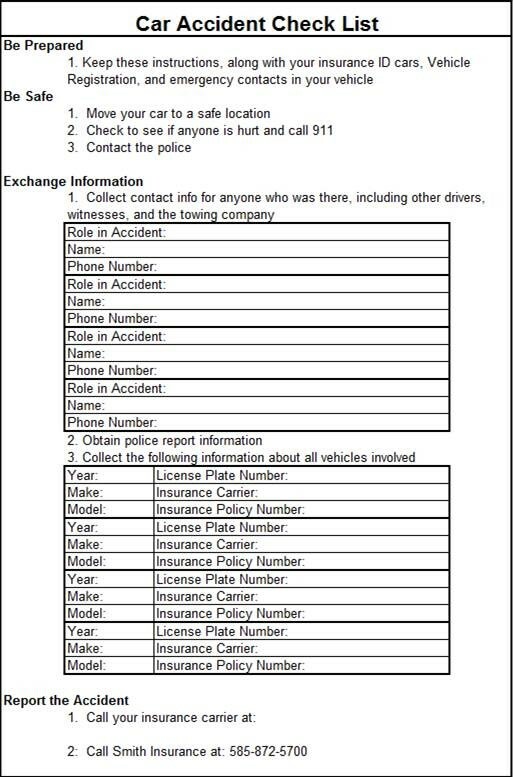 Make sure to record the name, contact information, and role that the individual played in the accident. 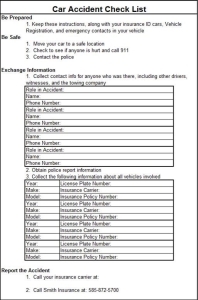 Fourth – Obtain the police report information and collect the following information about all vehicles involved in the accident: License place, car insurance carrier, auto insurance policy number. Lastly – call your car insurance carrier and your independent insurance agent. If you are unsure of who to call, please don’t ever hesitate to reach out to Smith Insurance in Rochester at 585-872-5700!